Hi-Opt 2 counting system was developed for advanced blackjack players; it is more complicated than Hi-Lo count or even Hi-Opt 1. But, anyway, if you want to use it you should learn basic blackjack strategy first and one of these card counting systems: Hi-Lo count or The KO Count, because you will not be able to understand Hi-Opt 2 without this knowledge. 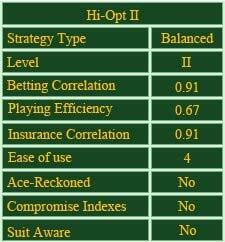 Using Hi-Opt 2 separately, you will not get much edge: this system works only together with card counting. The main difference between Hi-Opt 1 and Hi-Opt 2 is card values: Hi-Opt 2 counting system forces you to add or subtract 2 points as well as 1 point; that makes it to be more complicated. So, as you can see, Hi-Opt 2 counting is more complicated because of given card values. It is a balanced strategy, and it means that you start your counting with 0 and you should end it with 0 too. Do not forget to count a dealer's cards and the cards of other players who sit at the same blackjack table with you. Remember, that you should count every card which was dealt from a shoe! Hi-Opt 2 advises you to increase your bets when you see that many high cards are left in a shoe: it means that you have more chances to get a good card and improve your result in such a way. That is why all low cards are counted as +1: they let you know that high cards are still in a shoe; you subtract 1 or 2 points from your total every time when a high card is dealt because it means that your chances to get it decrease. As you can see, Hi-Opt 2 counts Aces as being neutral. Anyway, do not forget to notice how many Aces have been already dealt and how many are still left in a shoe. It is obvious, that Aces can influence the game of blackjack much: if you see that a quarter-deck is dealt but no Aces were shown - add 1 to your count; but if 2 Aces were dealt already - subtract 1 from your count total.